Kranji War Cemetery, Joint Grave, Plot 23, Row A, Grave 15-16, Age 29. A witness stated that this soldier received a gunshot wound to his chest and that ‘he was given a drink of water, but was not in a good state at this time.’ It is alleged by survivors of this action that Japanese troops moved into the area and were seen bayoneting the wounded. Soldier was reported as missing in action in the vicinity of Reformatory Road following withdrawal to the new line. This was caused by friendly artillery fire forcing the line back approximately one mile. Hector John Bishop and Joyce Davenport wedding with best mate Gus Magor on right. Bluey Bishop centre with best mate Gus Magor on right. Gus Magor returned to WA and married Ruth Davenport, sister to Blue Bishop’s wife Joyce (Davenport) pictured below. Blue Bishop’s son Dennis Bishop was born 26 February 1942, 14 days after the death of his father. Gleeson who placed above death notice in West Australian Newspaper was the father of Stephen John Gleeson, WX16736 who was also in 2/4th and one of only two survivors from the 5 boys from Mundijong. 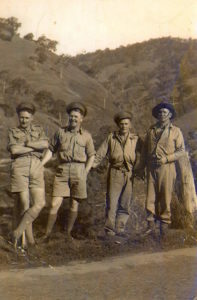 Steve Gleeson had his right leg amputated in 1943 because of a tropical ulcer whilst on the Thai-Burma Railway. Hector Bishop’s name is inscribed on the War Memorial at Byford.